This MOOC is offered by The University of Buckingham (UK), which is supporting the Blick Mead Stonehenge archaeological dig (project leader Professor David Jacques). The University’s Stonehenge speciality is reflected in an MA by research (taught in London) on archaeology and Stonehenge. 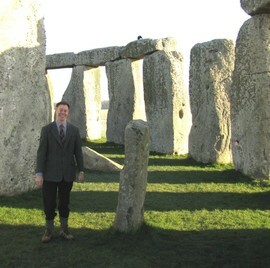 Your MOOC tutor is Professor Graeme Davis, University of Buckingham, who combines enthusiasm for archaeology and Stonehenge with subject speciality in the humanities and linguistics. To consider your own response to Stonehenge and reflect through a Journal. Additionally students have an opportunity to develop a connection with the University of Buckingham. We want to get to know you! No entry requirements. This MOOC is open to all. The materials are a spur to your own investigation and can be studied at a variety of academic levels. Students whose first language is not English are welcome to this MOOC, and may find particularly useful the work on Stonehenge as a part of British culture. Stonehenge as a landscape of prehistoric sites. The chronological context: the Mesolithic, the Neolithic and the building of the Stonehenge. The big Stonehenge questions: When? By whom? How? and Why? The wider context of the Stonehenge Landscape. Reactions to Stonehenge from Geoffrey of Monmouth through the antiquarian tradition to the modern archaeological response. Throughout the emphasis is on your response. This course looks at the archaeological response, at responses through history, and the cultural responses. On completion students are offered a Statement of Participation. Workload can be varied to suit individuals. A guide is to look at the MOOC over five weeks at a chapter a week, and allow around two hours per week. However there are many additional ideas presented for you to use in exploring Stonehenge, including reading novels and listening to symphonies. Maybe you will want to visit Stonehenge, or talk with us about visiting our Blick Mead dig. Maybe you will want to compare Stonehenge with a monument in your vicinity. Of course, students who want to skim the materials can do just this. These materials are a jumping off point for you to explore what Stonehenge means to you.